This article is about a Palestinian city. For the nearby refugee camp, see Khan Yunis Camp. Khan Yunis (Arabic: خان يونس‎, also spelled Khan Younis or Khan Yunus; translation: Caravansary [of] Jonah) is a city in the southern Gaza Strip. According to the Palestinian Central Bureau of Statistics, Khan Yunis had a population of 142,637 in 2007 and 202,000 in 2010 and 350,000 in 2012. Khan Yunis, which lies only four kilometers (2.5 miles) east of the Mediterranean Sea, has a semi-arid climate with temperature of 30 degrees Celsius maximum in summer and 10 degrees Celsius maximum in winter, with an annual rainfall of approximately 260 mm (10.2 in). The Constituency of Khan Yunis had five members on the Palestinian Legislative Council. Following the Palestinian legislative election, 2006, there were three Hamas members, including Yunis al-Astal; and two Fatah members, including Mohammed Dahlan. The city is now under the Hamas administration of Gaza. Before the 14th century, Khan Yunis was a village known as "Salqah." To protect caravans, pilgrims and travelers a vast caravan serai was constructed there by the emir Yunus al-Nûrûzi Khan in 1387-88, a Turkic ruler. The growing town surrounding it were named "Khan Yunis" after him. In 1389 Yunus was killed in battle. Yunus ibn Abdallah an-Nuzuri ad-Dawadar was the executive secretary, one of the high-ranking officials of the Mamluk sultan Barquq. The town became an important center for trade and its weekly Thursday market drew traders from neighboring regions. The khan served as resting stop for couriers of the barid, the Mamluk postal network in Palestine and Syria. In late 1516 Khan Yunis was the site of a minor battle in which the Egypt-based Mamluks were defeated by Ottoman forces under the leadership of Sinan Pasha. The Ottoman sultan Selim I then arrived in the area where he led the Ottoman army across the Sinai Peninsula to conquer Egypt. During the 17th and 18th centuries the Ottomans assigned an Azeban garrison associated with the Cairo Citadel to guard the fortress at Khan Yunis. Pierre Jacotin named the village Kan Jounes on his map from 1799. In 1863 French explorer Victor Guérin visited Khan Yunis. He found it had about a thousand inhabitants, and that many fruit trees, especially apricots were planted in the vicinity. 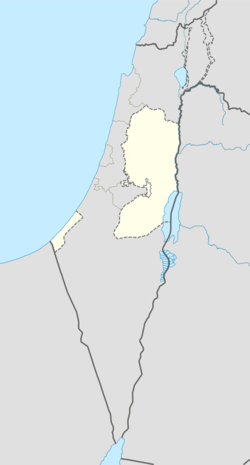 At the end of the 19th-century the Ottomans established a municipal council to administer the affairs of Khan Yunis, which had become the second largest town in the Gaza District after Gaza itself. In the 1922 census of Palestine conducted by the British Mandate authorities, Khan Yunis had a population of 3890 inhabitants; one Jew, 23 Christians and 3866 Muslims, decreasing in the 1931 census to 3811, in 717 houses in the urban area and 3440 in 566 houses in the suburbs. 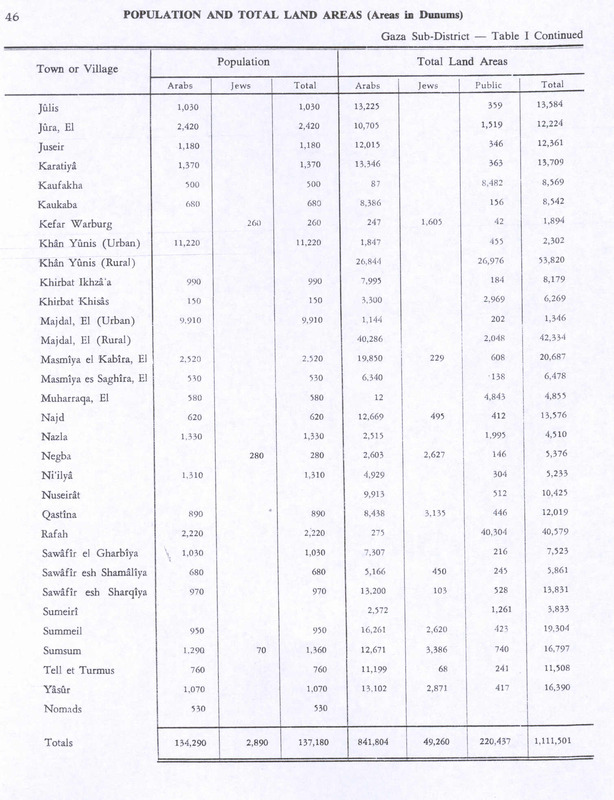 In the 1945 statistics Khan Yunis had a population of 11,220, 11,180 Muslims and 40 Christians, with 2,302 (urban) and 53,820 (rural) dunams of land, according to an official land and population survey. 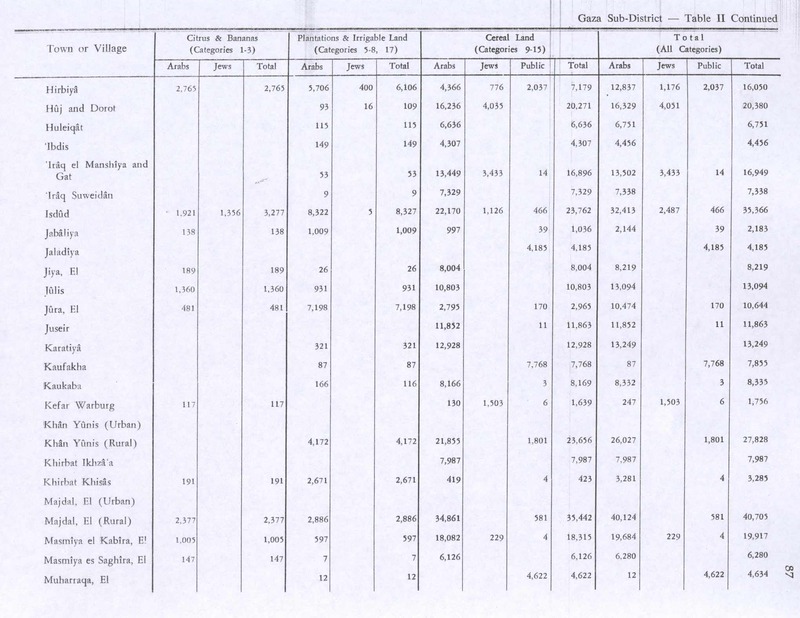 Of this, 4,172 dunams were plantations and irrigable land, 23,656 used for cereals, while 1,847 dunams were built-up land. During the night of 31 August 1955, three Israeli paratroop companies attacked the British-built Tegart fort in Khan Yunis from where attacks had been carried out against Israelis. The police station, a petrol station and several buildings in the village of Abasan were destroyed, as well as railway tracks and telegraph poles. In heavy fighting, 72 Egyptian soldiers were killed. One Israeli soldier was killed and 17 were wounded. The operation led to a ceasefire on September 4, forcing President Gamal Abdel Nasser and the Egyptian government to halt Palestinian fedayeen operations against Israel. One of the mechanized companies was commanded by Rafael Eitan. Before the Suez War, Khan Yunis was officially administered by the All-Palestine Government, seated in Gaza and later in Cairo. After a fierce firefight, the Sherman tanks of the IDF 37th Armored Brigade broke through the heavily fortified lines outside of Khan Yunis held by the 86th Palestinian Brigade. It was the only site in the Gaza strip where the Egyptian army put up any resistance to the Israeli invasion of Gaza, but it surrendered on 3 November 1956. There are conflicting reports of what happened. Israel said that Palestinians were killed when Israeli forces were still facing armed resistance, while the Palestinians said all resistance had ceased by then, and that many unarmed civilians were killed as the Israel troops went through the town and camp, seeking men in possession of arms. The killings, dubbed the Khan Yunis massacre, were reported to the UN General Assembly on 15 December 1956 by the Director of the United Nations Relief and Works Agency, Henry Labouisse. 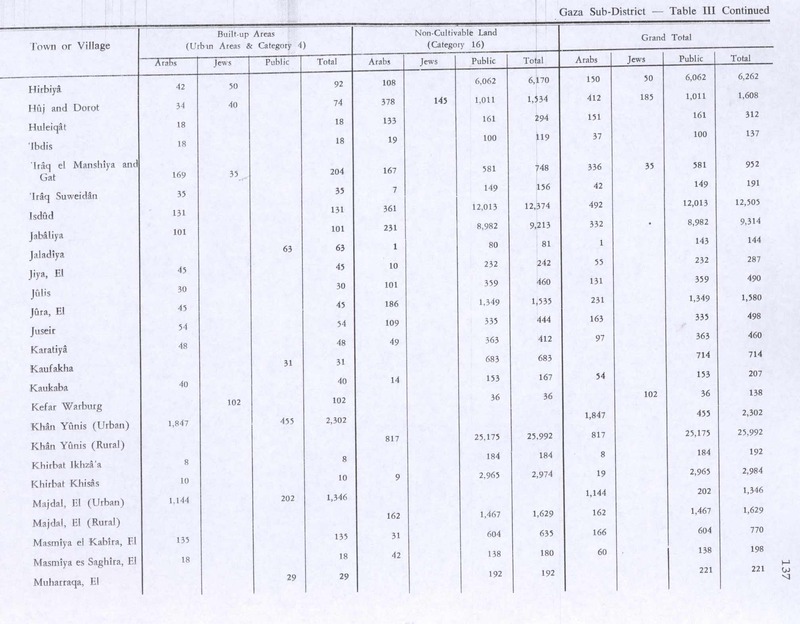 According to the report, the exact number of dead and wounded is not known, but the director received lists of names of persons allegedly killed from a trustworthy source, including 275 people, of which 140 were refugees and 135 local residents. 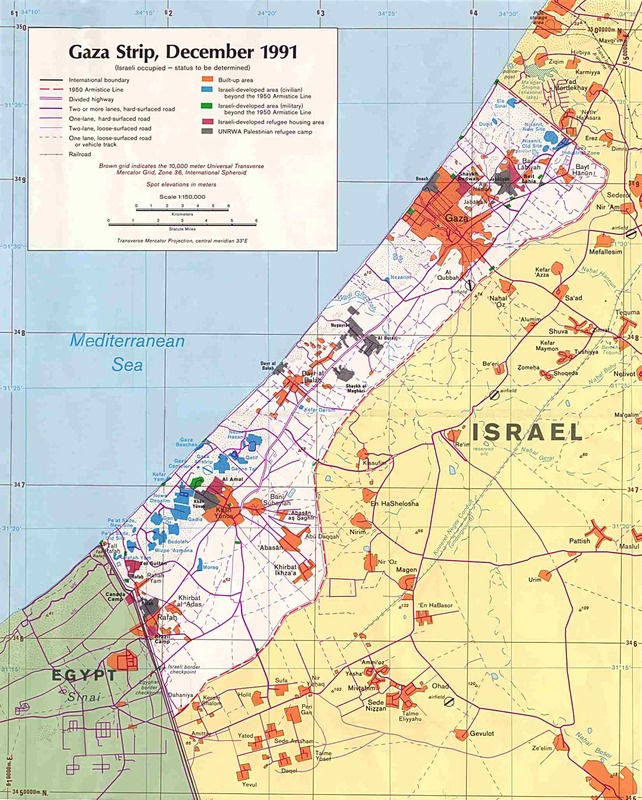 After 1959, the All-Palestine Government of Gaza Strip was abolished and the city was included in the United Arab Republic, which was shortly disestablished and the Gaza Strip came under the direct Egyptian military occupation rule. In 1967, during the Six-Day War Israel occupied Khan Yunis again. Khan Yunis was the site of Israeli helicopter attacks in August 2001 and October 2002 that left several civilians killed, hundreds wounded and civilian buildings within the vicinity destroyed. It is known as a stronghold of Hamas. Khan Yunis is the second largest urban area in the Gaza Strip after Gaza City. It serves as the principal market center of the southern territory's southern half and hosts a weekly Bedouin souk ("open-air market") mostly involving local commodities. As of 2012[update] Khan Yunis had the highest unemployment rate in the Palestinian territories. The University College of Science and Technology is located in Khan Yunis. ^ a b 2007 PCBS Census. Palestinian Central Bureau of Statistics (PCBS). 2009. p. 63. ^ Abu-Khalaf, Marwan. Khan Younis City. El-Agha. July 2002. ^ Reed Johnson (February 4, 2010). "Joe Sacco produces comics from the hot zones". Los Angeles Times. ^ a b UNRWA Report to the UN General Assembly November 1 – December 14, 1956 Archived June 29, 2013, at the Wayback Machine. : "The town of Khan Yunis and the Agency's camp adjacent thereto were occupied by Israel troops on the morning of 3 November. A large number of civilians were killed at that time, but there is some conflict in the accounts given as to the causes of the casualties. The Israel authorities state that there was resistance to their occupation and that the Palestinian refugees formed part of the resistance. On the other hand, the refugees state that all resistance had ceased at the time of the incident and that many unarmed civilians were killed as the Israel troops went through the town and camp, seeking men in possession of arms. The exact number of dead and wounded is not known, but the Director has received from sources he considers trustworthy lists of names of persons allegedly killed on 3 November, numbering 275 individuals, of whom 140 were refugees and 135 local residents of Khan Yunis." ^ "Graphic novel on IDF 'massacres' in Gaza set to hit bookstores". Haaretz. Dec 21, 2009. ^ McGreal, Chris (12 September 2005). "Hamas celebrates victory of the bomb as power of negotiation falters". The Guardian. Retrieved 23 July 2014. Derori, Zeʼev (2005). Israel's reprisal policy, 1953-1956: the dynamics of military retaliation. Routledge. ISBN 0714685518. Feldman, Ilana (2008). Governing Gaza: Bureaucracy, Authority, and the Work of Rule, 1917–1967. Duke University Press. ISBN 0822342405. Guérin, V. (1869). Description Géographique Historique et Archéologique de la Palestine (in French). 1: Judee, pt. 2. Paris: L'Imprimerie Nationale. Hathaway, Jane (2002). The Politics of Households in Ottoman Egypt: The Rise of the Qazdaglis. Cambridge University Press. ISBN 0521892945. Katz, Samuel M. (1988). Israeli Elite Units since 1948. Osprey Publishing. ISBN 0-85045-837-4. Morris, B. (1993). Israel's Border Wars, 1949-1956: Arab Infiltration, Israeli Retaliation, and the Countdown to the Suez War. Oxford University Press. ISBN 0-19-829262-7. Sacco, J. (2009). Footnotes in Gaza. New York: Metropolitan Books. ISBN 0-8050-7347-7. Sharon, M. (1999). Corpus Inscriptionum Arabicarum Palaestinae, B-C. 2. BRILL. ISBN 9004110836. Varble, Derek (2003). The Suez Crisis 1956. London: Osprey Publishing. ISBN 1841764183. Wikimedia Commons has media related to Khan Yunis.